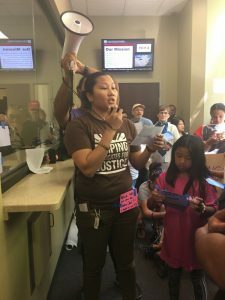 St. Paul, Minn. (Aug. 28, 2017) — Mobilized by the #ReleaseMN8 campaign, over 70 community members gathered Aug. 28 at Ramsey County Attorney John Choi’s office to demand that he reduce Chamroeun Phan’s 365-day prison sentence by one day, which would guarantee him automatic relief from deportation. Phan has been in immigration detention for a year, despite being issued deportation relief by an immigration judge in May. Choi himself has told Phan’s family he sympathizes with them, saying “I do not believe that deporting Mr. Phan to a country where he has never lived and whose language he does not speak is a fair consequence.” Yet now that the power is in his hands, Choi seems reluctant to take any action. A husband and father from Maplewood, Minn., Phan arrived to the U.S. as an infant and a refugee after his parents fled the Khmer Rouge genocide. He was born in a Thai refugee camp and has never set foot in Cambodia, the country the Trump Administration is now seeking to deport him to. 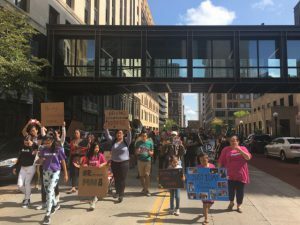 Earlier this spring, an immigration judge issued Phan a waiver granting him deportation relief due to the extreme hardship his deportation would cause his U.S. citizen wife, daughter and elderly parents. The Department of Homeland Security (DHS) quickly filed an appeal, which kept Phan in detention.